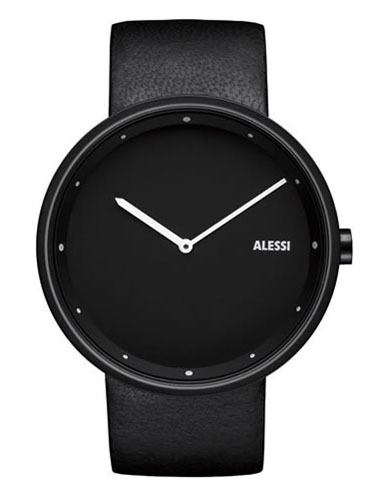 This beautiful Alessi watch was designed by Andrea Branzi, known for his innovative groundbreaking creations and approach to design. "Out_Time" is a large Unisex watch. This watch features unique etched white dot indexes on the outer edge of the bezel. Indexes also appear on the inner black dial which exhibits a modern open face design. The watch also features a black stainless steel case and a smooth black genuine leather strap.